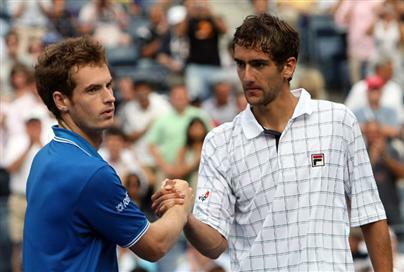 NEW YORK -- Andy Murray of Britain has been upset at the U.S. Open, losing in straight sets to Marin Cilic of Croatia. The 16th-seeded Cilic beat the No. 2 Murray 7-5, 6-2, 6-2 Tuesday to reach his first Grand Slam quarterfinal. Murray was the runner-up at Flushing Meadows last year. He appeared to have trouble with his left wrist against Cilic, flexing it and grimacing. Cilic hit 35 winners to only 13 for Murray. Cilic next plays No. 6 Juan Martin del Potro of Argentina. Do you trust "experts"? Trust yourself. You never hear from them afterwords. That is exactly what I like about sports. Transparency. All of the talking ends when you play well. This is a precise example of "copy and paste journalism". See for yourself below. Not that Murry didn't win in 4. He lost in 3. 700% wrong Mr. Cronin. Murray showed last year in knocking out Rafa Nadal and reaching the final that he is here to stay, and this year, he's attempting to show that he's matured enough to win his first major. His on-court intelligence cannot be underestimated, nor can his ability to read his foe's tendencies and make mid-match adjustments. Plus, his return of serve is already legendary. Just ask the big-serving Taylor Dent, who was passed dozens of times and made to hit impossibly low volleys in his rapid loss to the Scot on Sunday night. Murray and the tall and powerful Cilic have met three times, with the world No. 2 taking all those contests, including a straight-sets win at 2009 Roland Garros. Cilic has done a good job gutting out wins here and can rip the ball off both wings. He moves well for a guy who is 6-foot-6 and, if he stays patient, can hurt Murray. But the Croat will likely be too pumped up and get confused trying to figure out what Murray's game plan is. Cilic will take a set, but Murray will get through in four. Bravo Marine.Konacno lijepe vijesti o hrvatskom tenisu.Mozes ti i bolje.Samo naprijed.